It's often said that life, like the music industry, goes in cycles. 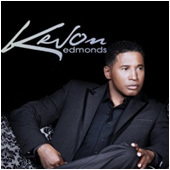 So it is for Kevon Edmonds — singer, songwriter, producer and proud carrier of the R&B torch. His new album, Who Knew, marks another milestone in the career of a man who embodies the word artist: recording only the finest material, putting his heart and soul into each note, and staying true to his musical roots without following trends or compromising himself for the sake of airplay or fame. Who Knew marks the Indianapolis native's long-awaited return and finds him with a new label, new material, a new home in Nashville and a fresh start. "I felt it was the right time to make a record," he says. "I sensed it was time for me to get back into action. Things really do seem to move in ten-year cycles for me, from starting After 7 to my first solo album, 24/7, and now to Who Knew." Kevon Edmonds, one of six brothers, formed the group After 7 with his brother Melvin and classmate Keith Mitchell while attending Indiana University in 1988. As lead singer, he took the ensemble to the Top 10 singles chart eleven times — twice to Number One with "Ready or Not" and "Can't Stop." Signed to Virgin Records and a production deal with LaFace — L.A. Reid and sibling Kenneth "Babyface" Edmonds — who penned their chart-topping hits, After 7 enjoyed two Gold albums, a multi-Platinum album, three Gold movie soundtracks and successful tours. "We were pretty mature when the opportunity came around to get a record deal and go on the road," Kevon recalls. "We had lived responsibly, paid our bills, went to work on time, and nobody lost their head when we began to experience success. We were all just excited and grateful. What we loved most was playing live. There were other groups that were edgier and sold more units, but we held our own. We enjoyed being a performing group and not just a studio project. The focus was to put out good music and entertain." When the band dissolved in 1997, Kevon worked with LaFace productions, contributing to film soundtracks, adding background vocals to LaFace artists' albums, gathering talent for studio-session choirs, and acting as songwriter and executive co-producer (with Babyface) on his RCA Records solo debut, 24/7. The 1999 release was certified Gold, and the title track climbed to #2 on the charts. The learning experience of being on his own and signing a deal is something he carried over to the making of Who Knew. "When I was shopping for my first solo contract, L.A. shared something significant with me that made it so much easier to decide where my home would be for that project," he explains. He said, "You want to go with a company that has the hots for you, the most interest in you, and that will do whatever it takes for you. I weighed the factors that were important to me, and at that time I didn't want to come into a label that was partly owned by my brother, because people would think it was nepotism in my behalf. So I chose RCA based on that good advice, and I used it again as a rule of thumb with this album when I signed with Make Entertainment/Image Distribution. I only want to deal with folks who treat me as a priority, not just them being a priority to me. It's no good when you treat someone as a priority who treats you as an option, and that's how I put together my new team." Edmonds' goal in creating Who Knew was to bridge the gap between classic R&B and today's interpretation of the genre. "R&B brings love back into music as a topic of discussion that comes with respect and appreciation," he says. "I would like to bring that to the core of young listeners whose music does not necessarily speak about love in a fashionable way, that isn't tasteful, that does not appreciate women and love itself. Musically, I'm holding on to the music I've known. Some of my new songs have a more mature approach for the older listener, but some of them also open up the younger listener to where this music comes from. The bridge comes in creating fresh music with a youthful approach while at the same time not going against the grain of what mature listeners appreciate." Edmonds worked with some of the hottest new names in production and songwriting for Who Knew. He co-wrote "OH" with producer Greg Curtis and describes it as "a throwback that will feel good to both young and older listeners alike. It's a very moody song with a message about recommitting oneself to a relationship." The hot new production team of KADIS & SEAN, out of Boston, cut several tracks, including "Hurt Too Much To Cry, "April's Fool" and the title track, "Who Knew". "I wanted to come to the table with Kadis & Sean because they have a fresh sound that I thought would help mold and set the tone of this record in areas that would allow me to rub shoulders with more youthful listeners,"Edmonds remarks. "Their production is heavy on the drums with good-feeling rhythms. Their writing is fresh, they have great melodies, and they're able to construct songs that work well for me." Dave Edmonds wrote and produced "Angels," and also worked on some tracks with Jason Edmonds. "They're both my nephews, and I had no idea that the love for music had filtered down," Edmonds laughs. "Neither of them had ever advertised what they were doing!" Overall, he says, Who Knew is meant to be a journey. "It was important for me to create the peaks and valleys, the highs and lows, the tempo changes, so that listeners don't know what's coming around the bend. It's been a wonderful process, but at the same time the most aggressive process I've ever experienced. I have never put an album together as swiftly as this one. I really hit the ground running." Kevon Edmonds has accomplished everything that artists dream of and more. But when asked to define success, he says it's not about charts, hit singles or awards. "It's how I've been blessed in my lifetime," he states. "It's not about material things, like the number of houses or cars you own, or how often you travel. It's about family, friends and the fans. Those other things are nice, but the most important thing for me is trying every day to keep God first in my life and appreciating the richness of what my family, true friendships and loyal fans bring. They are what make me feel most enriched and have impacted my life in such a positive way. My life is perfect just the way it is because of them, and that's the way my success is measured."